The SU-57 is a premium Rank I Russian tank destroyer with a battle rating of 2.3. It was introduced in Update 1.49 "Weapons of Victory". 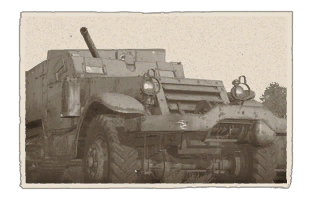 The vehicle is similar to the American 75 mm GMC M3 by mounting a gun on the back of a half-track. The 57 mm gun can nearly penetrate most tanks at its battle rating range, nearly 100 mm at 500 meters away with regular AP rounds. The most distinctive feature of this vehicle is its gun. Armed with very accurate 57 mm M1 gun with penetration of almost 90 mm on 2000m and fast reload speed, SU-57 is very effective long-range tank destroyer. Aside from that, SU-57 is very mobile, fast and agile. This however is vital for its survival as the vehicle basically lacks adequate armour protection. In order to use the SU-57 effectively it is essential to combine its firepower with its mobility - attack selected targets from distance and be prepared for rapid relocation, as one well placed enemy shot can tear the vehicle apart. On the other hand, one well placed shot of the 57mm gun can tear apart almost everything SU-57 encouters, especially when aiming for weak spots. Suspension wheels are 15 mm thick, bogies are 10 mm thick, and tracks are 7 mm thick. Wheels in the front are 2 mm thick. Belly armour is 6.35 mm thick. Ammo racks of the SU-57. Accurate and powerful gun capable of penetration even on vast distances. Can destroy basically everything it encouters very easily. Great mobility and speed of the halftrack vehicle compared to tanks. Ability to snipe from distance and relocate quickly if needed. Enemy shells often fly through its thin armour without dealing any serious damage. 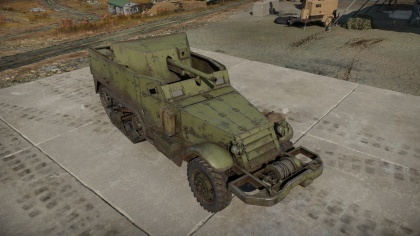 Crew has better protection compared to the American 75mm M3 GMC. Lack of armour protection - vulnerable even to machine gun fire. Vulnerable to shrapnels and artillery shelling due to its open top. 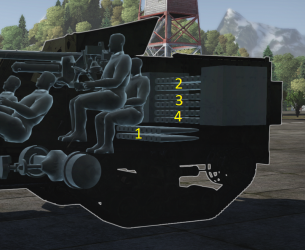 Cannot turn on one spot as tracked SPGs can due to its halftrack configuration. The SU-57 began as the T48 57 mm Gun Motor Carriage from the United States. This is similar to their previous anti-tank vehicle the 75 mm GMC M3, which mounted a 75 mm M1897A4 gun instead. The development started from a British and American requirement for a vehicle mounting the 6-pounder gun. This was fulfilled with the 57 mm gun M1 (A US version of the 6-pounder) and this was installed on the rear of an M3 Half-track. Orders came in at April 1942, but the Americans soon drop theirs after the M10 GMC was put into production. Thus, the T48 was to be lend-leased to Allied countries and was never classified in American inventory. The vehicle was tested at the Aberdeen Proving Grounds in May 1942 and was upgraded along the way with new mounting and recoil mechanism. A gun shield with 5/8 inches of armour on the front and 1/4 inch armour on the sides and top provided protection for the crew, but was relatively low in height. The employment of the 75 mm GMC M3 had the T48 equipped with headlights that were demountable. The vehicle was approved for production in 1942 and was built until 1943 with 962 vehicles produced total. The vehicle was delivered to British and the Soviet Union as part of the Lend-Lease Act. The British were to use it in the Western Desert Campaign around Egypt and Libya, but victory was achieved before the vehicles could arrive and do anything. After that, the 57 mm gun on the T48 was being superseded by the 75 mm gun from the US and the 17-pounder from the British. The T48 became surplus in British inventory and some were shipped to the Soviet Union as aid as well. The T48 in Soviet service were called SU-57 (Samokhodnaya ustanovka 57 - Self-propelled gun 57) and they received about 650 units in the course of the war. Some went to the Polish People's Army as well. Aside from that, British and Americans still retained several T48s, but were all converted back into regular M3 Half-track carriers except for one in 1944. The German Wehrmacht also operated a few T48 as Half-track carriers due to being captured by the British and Soviet Union. The Soviet Union employed the weapon most notably in their Summer 1944 offensive Operation Bagration. It was widely used by the Soviet 16th Separate Tank Destroyer Brigade in 1943 at the Dnieper River and the 19th Brigade in 1944 at the Baranow bridgehead. These vehicles would continue to serve in various units up until the Berlin and Prague offensives into Germany and Poland. They were allocated to 60 vehicles per brigade and the SU-57s were used as mobile fire support for the infantry due to their mobility. The 57 mm proved very well in this role as it could effectively hide behind a hill and fire from a long range due to the 57 mm gun.